Oh Lorraine, this is lovely!!!! well done and what glorious rich colours. I love this! Is it winging its way to Leigh on Sea then? Distress ink pads..Fired Brick, Spiced Marmalade, Scattered Straw and Black, Maria. Oh, and the leaf has some Brushed Corduroy on it. His eyes are watch parts with DG over them and Papermania Dew Drops in bottom corner. 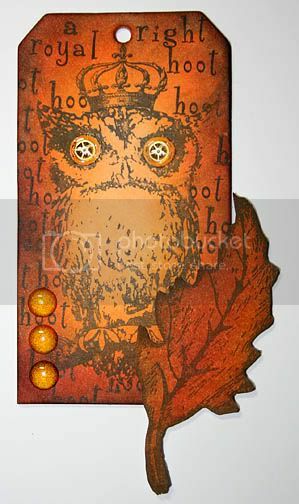 I masked the owl and crown (separate stamps) to do the text. Now he is rather gorgeous! hehe, that is very cute lou, you are a clever clogs. Wowwwwwwwwww he is Special isn't he? Lovely, and a beautiful leaf. Ooo he's gorgeous. I want some of those dew drops, they colour in with proM too I believe. Beautifully done, I always admire what you do.